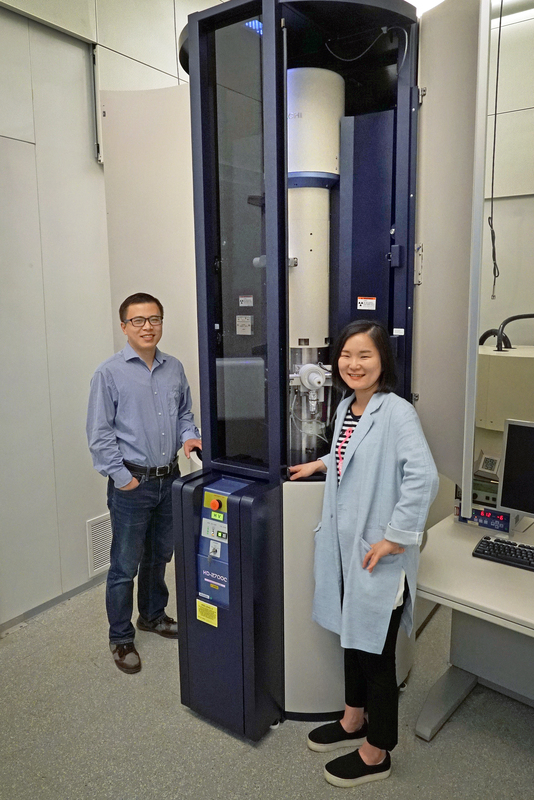 Brookhaven scientists Enyuan Hu and Sooyeon Hwang are pictured at the Center for Functional Nanomaterial's TEM facility where the researchers viewed the cathode material at a resolution of 0.1 nanometers. To investigate the reaction pathway, the scientists conducted multiple experiments at CFN and the National Synchrotron Light Source II (NSLS-II)—two DOE Office of Science User Facilities at Brookhaven. First at CFN, the researchers used a powerful beam of electrons to look at the FeF3 nanorods at a resolution of 0.1 nanometers—a technique called transmission electron microscopy (TEM). The TEM experiment enabled the researchers to determine the exact size of the nanoparticles in the cathode structure and analyze how the structure changed between different phases of the charge-discharge process. They saw a faster reaction speed for the substituted nanorods. At NSLS-II’s X-ray Powder Diffraction (XPD) beamline, scientists directed ultra-bright x-rays through the cathode material. By analyzing how the light scattered, the scientists could “see” additional information about the material’s structure. Combining highly advanced imaging and microscopy techniques at CFN and NSLS-II was a critical step for assessing the functionality of the cathode material. The University of Maryland team, pictured from left to right: Xiulin Fan, Xiao Ji, Fudong Han, and Zhaohui Ma. “We also performed advanced computational approaches based on density functional theory to decipher the reaction mechanism at an atomic scale,” said Xiao Ji, a scientist at UMD and co-author of the paper. “This approach revealed that chemical substitution shifted the reaction to a highly reversible state by reducing the particle size of iron and stabilizing the rocksalt phase.”Scientists at UMD say this research strategy could be applied to other high energy conversion materials, and future studies may use the approach to improve other battery systems. Citation: "High energy-density and reversibility of iron fluoride cathode enabled via an intercalation-extrusion reaction"